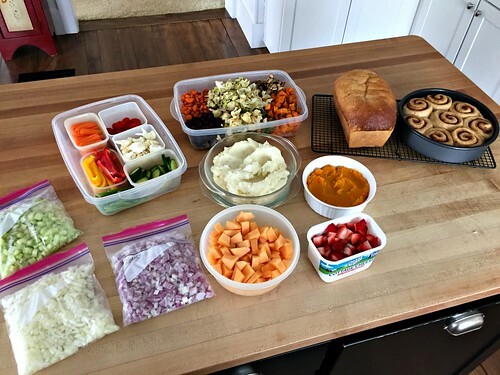 Our family has enjoyed having everyone home for Spring Break these last few days… I feel like all I’ve been doing is cooking and baking (something I enjoy doing more of when Dave is home to help “hold down the fort”)! 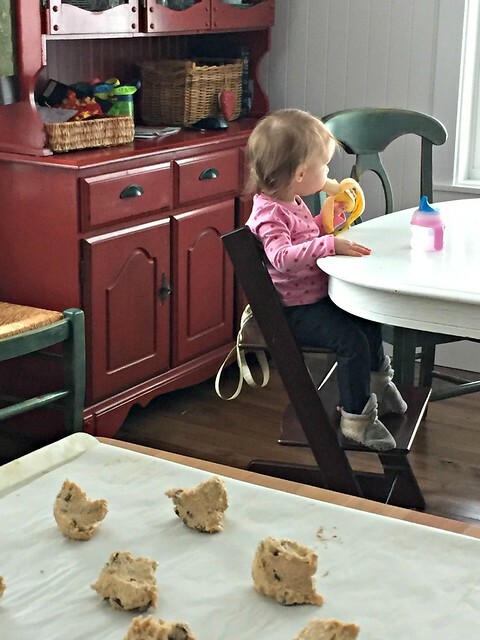 I’ll share more about all my spring break cooking and baking (and the fun stuff we do with our kids) next week… in the meantime, it just seems fitting that all my favorites for this month are kitchen-related! 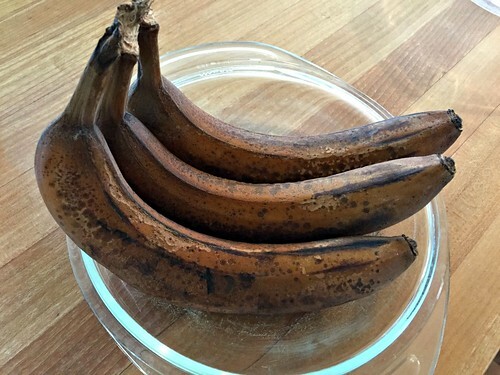 I’m not sure what your grocery store does with bananas that are starting to turn brown, but all the grocery stores around here simply wrap them in red tape and drastically reduce the price. 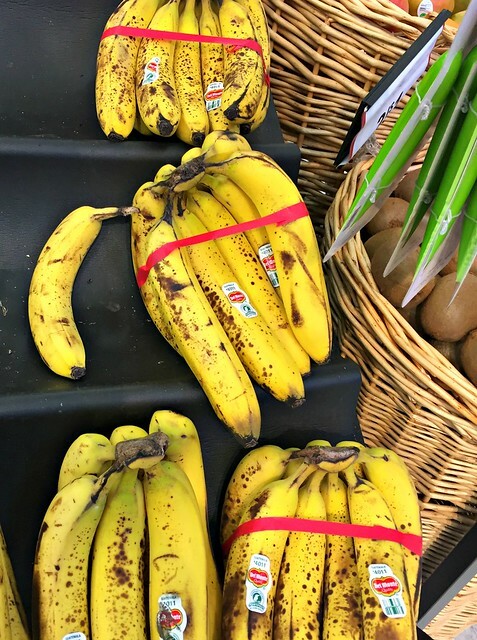 I’ve gotten red tape bananas as low as $0.29 per pound — and I always buy a few each week. I stick them in the freezer when I get home (still in peel), and use them throughout the week for various baking needs (I defrost them overnight in the fridge first). 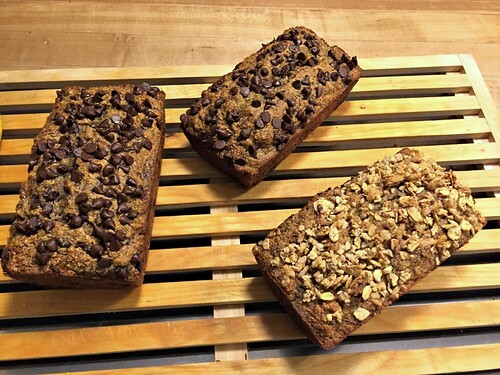 My favorite use of over-ripe bananas is quick breads. My kids LOVE banana bread and gobble it up like it’s a brownie. Truth-be-told, the chocolate chip banana bread recipe I shared many years ago practically IS like a brownie (or cake), but it sure is delicious — and a great way to use up discounted over-ripe bananas! 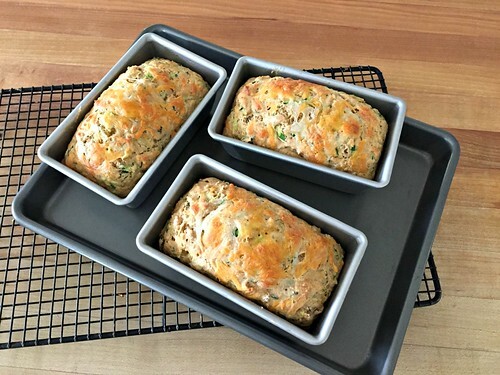 Over the past year, I have majorly “healthified” my quick bread recipes so they are actually a fairly nutritious snack or breakfast side dish. It might be worth mentioning that I also keep a zip-top bag of slightly over-ripe PEELED banana chunks in the freezer as well. I use these for smoothies, because I still want them to be frozen when I use them, and it’s almost impossible to peel a frozen banana! If it’s been a while since you’ve made banana bread, bars, cake, etc. check out the produce section of your local grocery store and see if they have any red-tape bananas you can stock up on! That way, you get a deal and don’t have to wait as long to use them! 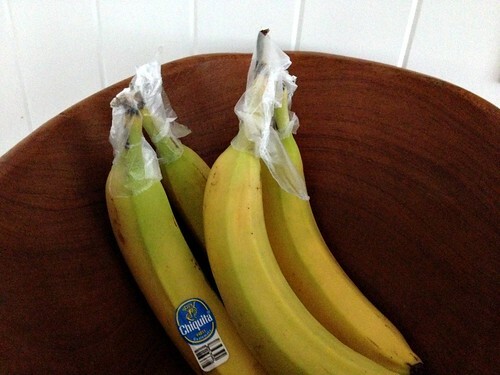 Oh, and did you know you can keep your regular bananas fresher longer by wrapping the tops with Glad Press ‘n Seal Wrap (which is another one of my favorite things)? Yes, it really works! 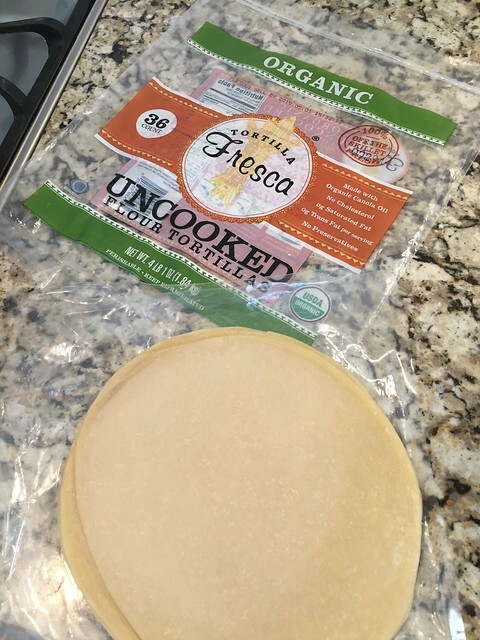 I’ve had the idea of homemade tortillas in the back of my mind for several months now and was almost ready to buy a tortilla press when I spotted these uncooked tortillas at Costco a couple months ago. 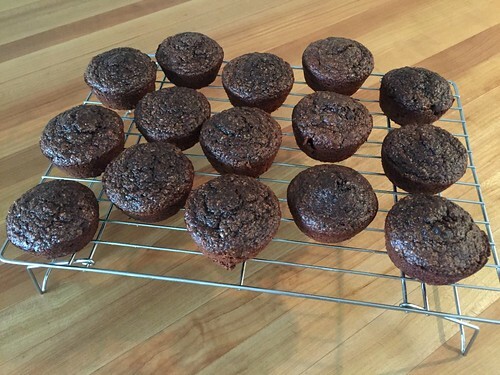 They only have 5 ingredients (wheat, water, oil, salt, sugar) and they are AMAZING! They only take 2-3 minutes to cook in a dry skillet and are significantly yummier than any pre-made tortilla we’ve ever purchased from the grocery store. We’ve used them for wraps, quesadillas, pizza-dillas, enchiladas, burritos, and more — all with extremely delicious results. Last week, I realized we still had 3 store-bought tortillas in the pantry and I used them for the kid’s lunches one day. 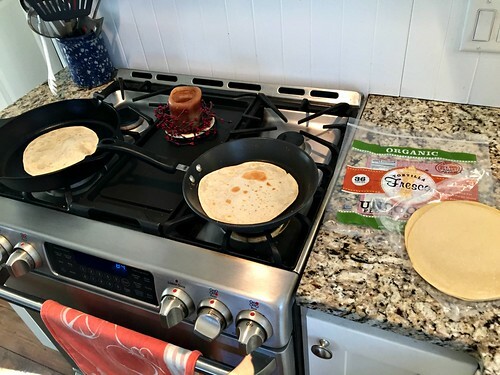 They all immediately noticed the difference and questioned why these tortillas didn’t taste good. Seriously, I hope this is one item Costco carries for a LONG time because they are amazing and they save me so much time over making my own from scratch! When the pans arrived, I immediately noticed how heavy-duty they were… and after baking with them only once, I was sold on the USA Pan brand. They are amazing! 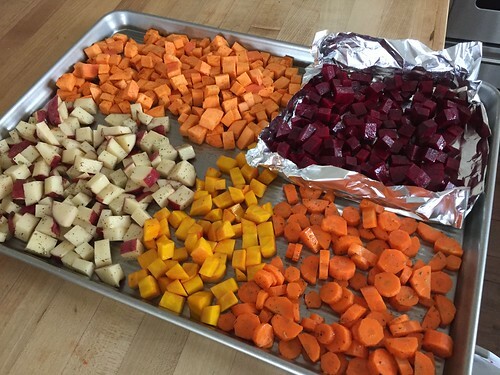 So last year, when I started roasting crazy amounts of vegetables every week, I decided I should eventually invest in new roasting pans. Now they are also on Amazon for the same price I paid at the store. 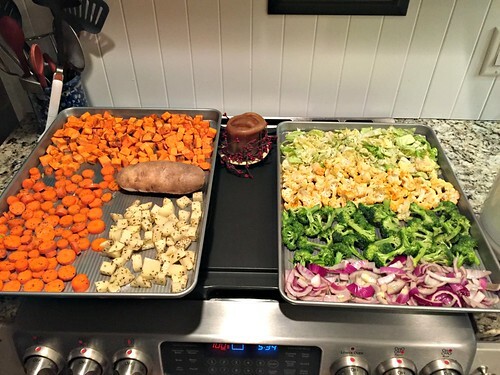 As you can see by the photo below — these pans are ENORMOUS! 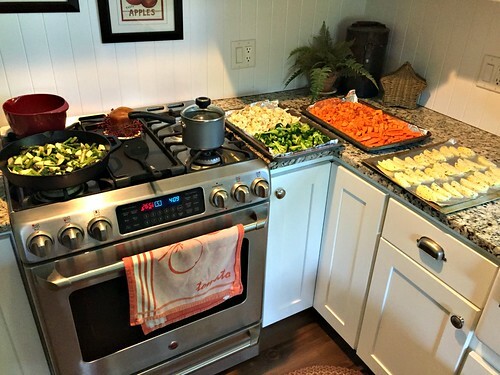 They fill up an entire oven rack, so they fully maximize my cooking and baking efforts! 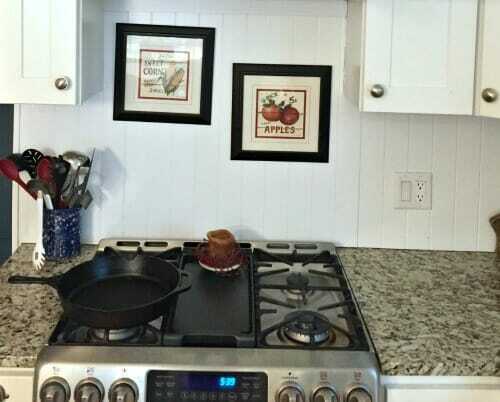 The USA Pans are so fantastic, I would recommend them for any kitchen and any cooking style. 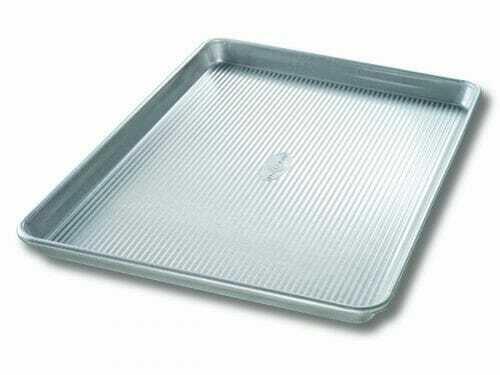 They are 100% completely non-stick, super heavy-duty, and cook very evenly. Plus, they are made in the USA! I honestly can’t say enough good things about this brand! Believe it or not, I was actually gifted with cast iron pans right before our wedding. I used them as decorations in our kitchen, and eventually sold them on Craigslist before we moved! Now, 12 years later, I’m faithfully using cast iron on a daily basis! It took me a while before I was willing to give cast iron a try though. I was so hesitant as they seem super high-maintenance (and they are, I suppose!). However, after scratching through a whole bunch of non-stick frying pans, refusing to pay an astronomical price for enamel cookware, and not having the patience to deal with stainless steel, I decided to give cast iron a try roughly 1 year ago. It was a bit of a rocky start (there were tears involved on more than one occasion) but I eventually learned to love my cast iron pans! I use them daily and the 12″ one actually “lives” on my stovetop! 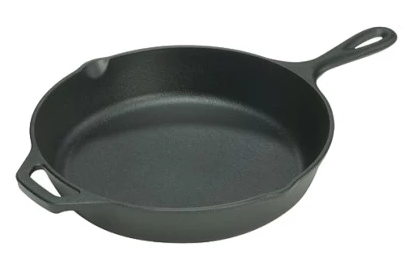 I have the 12.5″ Utopia skillet and an 8″ Lodge skillet — mainly because they were both “deals of the day” back when I purchased them at extremely reasonable prices! I use them both every morning as I make various different breakfasts, and often for dinner as well. 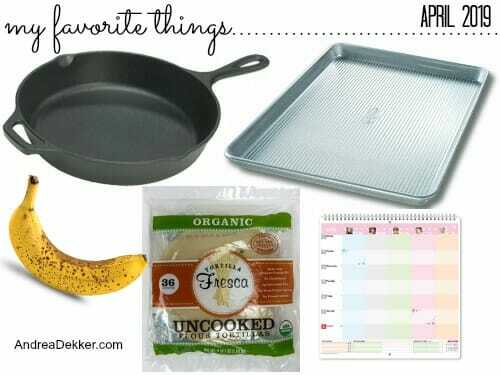 Sometimes we use them for all 3 meals if we make grilled cheese or quesadillas for lunch! They were definitely worth my minimal investment, and although they ARE still more high-maintenance than I’d like, they do a superb job of cooking our foods. 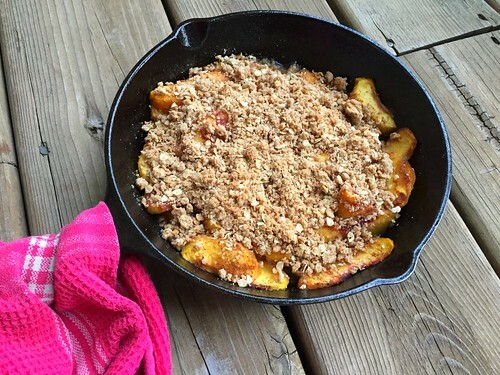 I’ve come to love the flavor of cooking with cast iron! 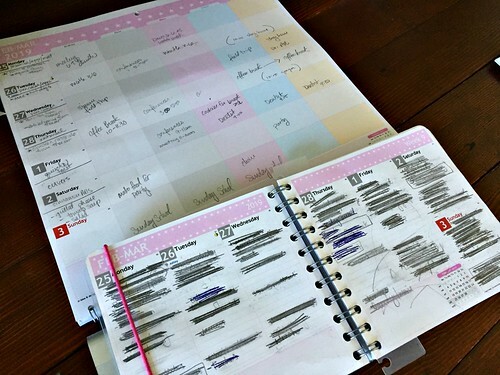 Last week, I shared what a “normal” weekday looks like for our family — and you know how much I love our normal routine! Honestly, our family thrives on structure and routine. However… (yes, there’s a “however”) every once in a while, it’s refreshing to have a break from “normal”, and that’s one reason we always look forward to Spring Break. Even though we don’t have big vacation plans, we love the change of pace this school break gives our family. I have a long list of foods I’m planning to make (Oreo Blondies, Snickerdoodles, Cheesecake, Cookie Crumb Truffles, and this sweet and spicy snack mix to name a few). I’ll also be roasting the turkey I bought after Thanksgiving and making tons of bread, rolls, cinnamon rolls, pizza dough, etc. 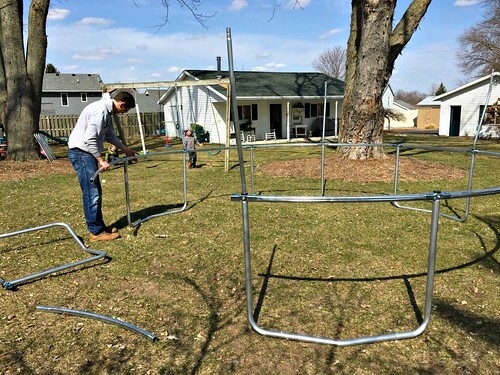 We have a few yard projects we hope to get started on, and we need to finish putting up the the trampoline the kids got for Christmas. 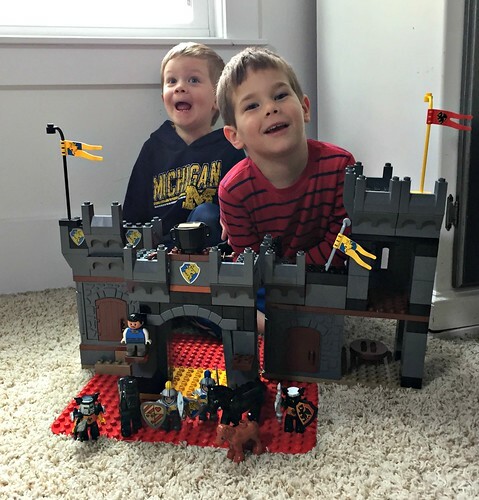 We’re also hoping to better organize our play room as an influx of LEGO’s (gifted to us from people at church) needs an out-of-the-way home so a certain 18 month-old doesn’t constantly ruin her brothers’ creations or drag handfuls of LEGO’s through the rest of our house! Yup, we have a lot to do this next week! 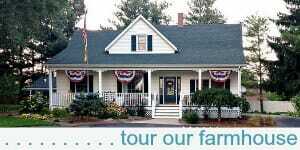 I’ll be back to normal blogging next week with a Peek Into Our Spring Break! I'm Taking a Break... Kind of! I have two cast iron skillets that I am trying to love. I find using and cleaning them so intimidating. Any tips? haha — I know EXACTLY how you feel. 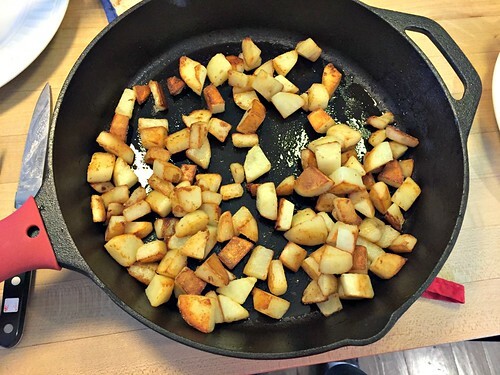 I was in your position last year at this time — desperately TRYING to love my cast iron! I think for me, it was just forcing myself to use them ALL the time. I actually purged my other frying pans so I didn’t have any other options. I saved one smaller non-stick pan for the kid’s scrambled eggs with cheese (that’s jut too much for me in cast iron) but everything else is in cast iron! Make sure it’s seasoned really well, make sure the pan is VERY hot before you put food in, use oil or butter to cook anything that gets sticky, cook over medium low heat (once the pan is hot), use a metal spatula so you can really scrape up the food, and don’t scrub with soap. I usually just wipe out my pan with a paper towel after light cooking. If I make something with tomatoes, fish, lemons, etc. then i’ll scrub it with kosher salt and hot water and immediately put it back on the stove over medium heat until the pan is really really dry (and hot). Then I rub a bit more oil over it and let it cool. I have my routine down now, so I do this all while cleaning up the kitchen after dinner and loading the dishwasher. it doesn’t seem like any extra work (but it DID when I first started). wow — that’s a lot of bananas! We have one store by us that ALWAYS sells red-tape bananas for $0.29 – $0.39 per pound, so I don’t feel the need to stock up as much! 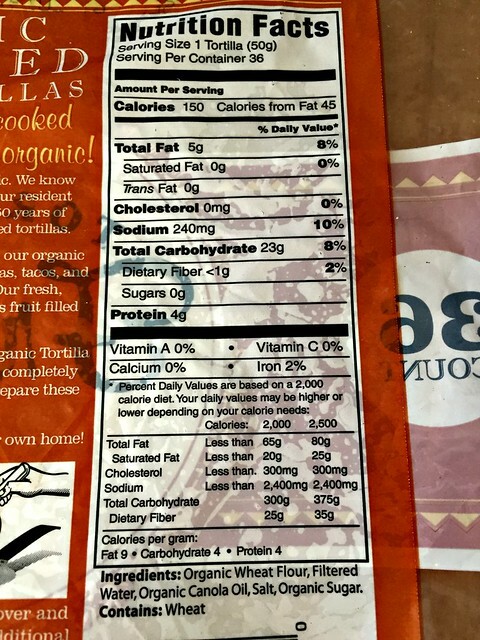 Hi Andrea – just wanted to say that my Costco (both when I lived in Oregon and now in Texas) has carried those “raw” tortillas for years – so hopefully you’re pretty safe in terms of them being around for a while! Like a previous commenter, I also cook them on the electric griddle usually! 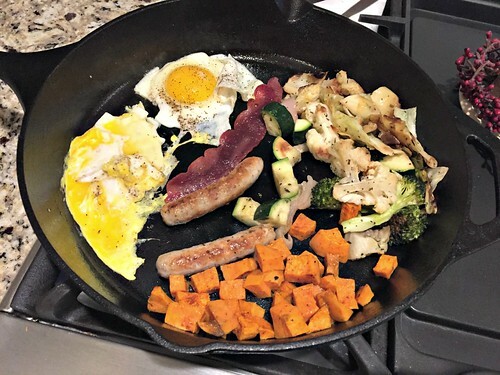 YES to USA pans and cast iron! I use them both on a regular basis! Since you are posting on cooking and you make all hot breakfasts, would you please share how you cook bacon-ie. 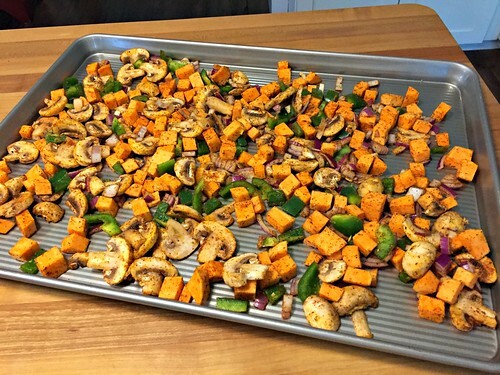 the entire package at once, which pan, oven or stovetop, etc. Thanks! I use my big griddle which can cook 1 pound in less than 10 minutes. Then I put it in zip-top bags in the fridge and freezer for later. I do the same with susage patties — cook several pounds and refrigerate and/or freeze for later. It makes hot breakfasts that much easier! We love those tortillas too! They really are delicious. They toast up nicely on the griddle (which you inspired me to buy), 3 at a time! We also eat them with chicken curry as a sort of roti prata bread. So good! I don’t know why I didn’t think of using my griddle (i use it several times a week) I’ll try that next time! Thanks! I love my USA pans. 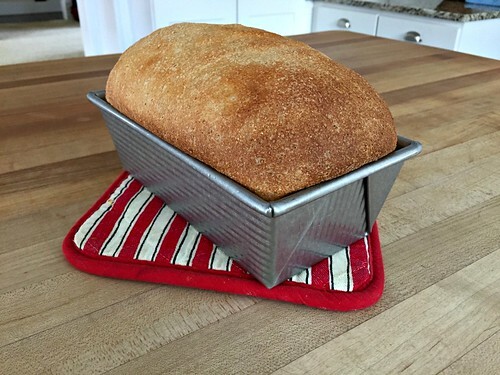 I bought the mini loaf pans, (a set of four), and I’m able to use them in the toaster oven during the summer when it’s too hot to turn the oven on. I have the large muffin tin and despite baking mini meatloaves, individual cinnamon rolls and savory cheddar cheese muffins nothing sticks to the surface. USA pans clean up so well. I make tortillas on occasion and have never used a tortilla press. I had one for a while but found it quicker to roll the dough out on my own. They aren’t perfectly round but they do the job. You don’t have to make too many at a time either as the dough will keep in the refrigerator for about three days. yes, I have the set of 4 mini loaf pans and LOVE them. I use them all the time — for much more than just bread. I often reheat small amounts of leftovers in them because NOTHING sticks! Oh, and I am definitely going to try homemade tortillas now that I know you don’t “need” a press! thanks! 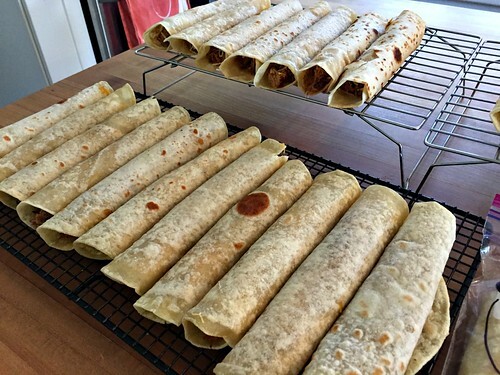 Homemade tortillas that I’ve made in the past are super easy, quick, and taste delicious! 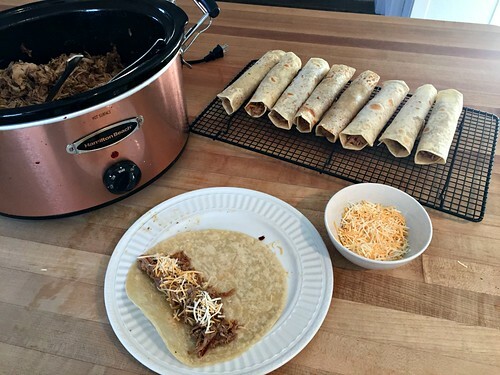 awesome — I have a recipe that seems SUPER easy, but I’ve delayed trying it as I don’t have the tortilla press. I’m definitely going to try it over Spring Break! I’m looking forward to the healthy quick bread recipe! 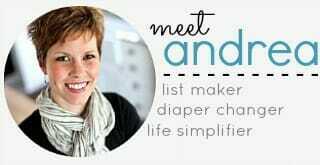 Hello Andrea! Just a quick note about the tortillas. I have made my own for years and you do not need a tortilla press! I actually got rid of mine. I do use a hand roller for pastry ( less than $4 on Amazon) to get them super thin and I use a griddle to speed things up since I have a big family to cook for. I had to smile about the turkey, because last night I just took a Thanksgiving turkey out of my freezer to thaw. I freeze my overtime bananas for bread too. They make the best banana bread! Switching to the USA pans does seem enticing. 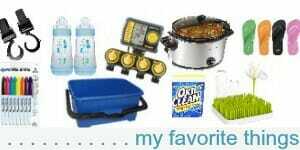 Thanks for sharing those items! perfect — thanks! Do you think a normal rolling pin would work? Or are the hand roller superior for this sort of thing? 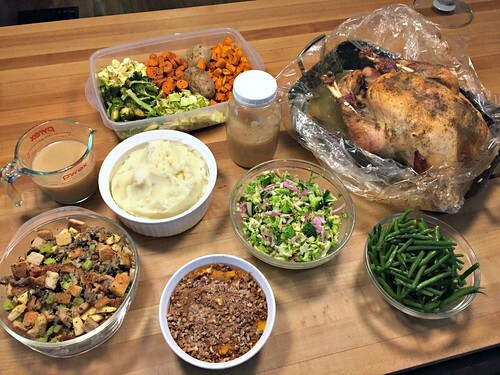 And yes, I just pulled the turkey out yesterday with the intention of roasting it (with all the fixings) on Thursday! Yes, I think the little hand roller gets the dough thinner than a regular rolling pin. Watch out, though, because little ones love to use them with Play doh too! ok cool — they are super cheap so I just added one to my Amazon cart. I’m going to a thrift store later this week, I’m going to look there for one too, but if I don’t find one, Amazon will be my source! Will you link to the one you decided to try? Thank you!